Some of the most recognizable art in the entirety of human history was created by one of our most sophisticated ancient cultures. Including not only painting and sculpture, the Egyptians created artistically in every endeavour from architecture to burial methods. Their works were symbolic, stylized, and use a myriad of media to vividly express their belief systems, wealth, power, and dedication to history and to life after death. 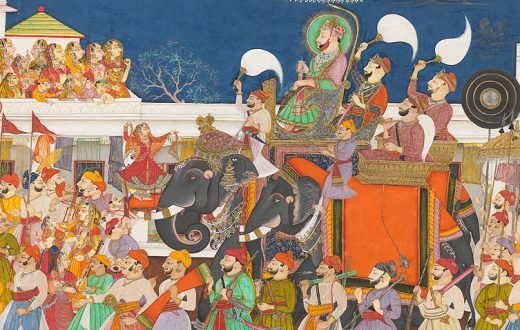 Glory to their gods and the recording of national events and victories were paramount to the purpose of their art. The 3000 year of Ancient Egyptian art is divided by scholars into dynasties, kingdoms, and eras. When what we picture as the golden age of Egypt was born, people had already been living in the Nile Delta for over 40,000 years. The Egyptians as we know them came into being when Upper and Lower Egypt became one during the dynasty of the first pharaoh, Narmer. 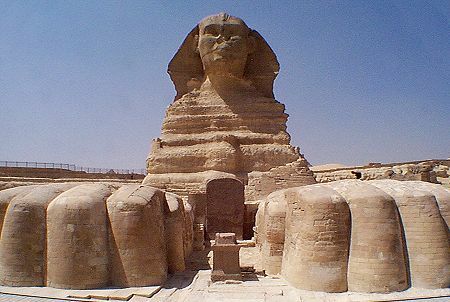 The Egyptians held on to their insular power until they were conquered by Alexander the Great in 332 BC and the Ptolemaic Era began. When Cleopatra died in 30 BC, Egypt ceased to be an independent nation and became a province of Rome. Art in the area prior to the creation of Egypt as a nation goes back nearly 15,000 years to stone carvings in the village of Qurta depicting bulls. It was quite a span of time before Egypt reached the height of civilization and created the works that are familiar to us today. Certain artistic rules, so to speak, created a convention in Egyptian art. The Egyptians favored order, and as such, their images are confined to certain standard aspects. Standing figures have parted legs, most figures are seen in profile, and there are proportions that measure perfectly from figure to figure. Male statues are sometimes darker in color than female statues. Statues share some of these conventions and they are most prevalent in reliefs and in fresco. Symbolism was very important in Egyptian artwork and the variations on the Pharoah as god are common. When Pharaohs were represented in the form of a particular god, the statue was much larger than if the god were represented on its own. Other symbolism, such as what was expressed in color or in the use of animals, imparted more meaning to a piece. For instance, the color of a figure’s skin indicated whether he or she worked indoors or out, the color of their clothing might indicate divinity or royalty, and stereotypical elements noted if the figure was from a different land. The size of a figure indicated the person’s or being’s importance. Some of the most notable examples of Egyptian art are in its architecture and complementing colossal sculpture. The pyramids at Giza are a triumph of design and would be difficult to complete by our own modern day builders. 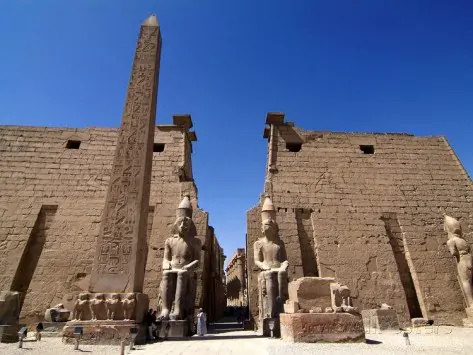 The city of Luxor with its columns of sculpted figures and alley ways of sphinxes is a grand and awe inspiring testament to the artistic achivements of the Egyptian people. Egyptian sculpture is well recognizable in its monuments, but sculpture was done in smaller scale as well. Small wooden statuettes known as Ka (ka was one of the five parts of the soul, the one that held the essence of life) were buried with the dead, leaving us an impression of what non-royal Egyptians may have been like. Also included in burials were “reserve heads” which were near perfect representations of the head of the deceased. These must have very closely resembled the departed because archaeologists have found features spanning a family line that are perfectly rendered each time showing the family resemblance. Tombs also sometimes include small sculptures of things the deceased may have owned or been partial to such as animals, buildings, slaves, and the boat that is meant to carry them to the afterlife. Painting conventions in Egypt required the use of only six colors, and any representations of a god were strictly done with its standard personal attribute, such as in the case of Horus who was always seen with a falcon’s head. 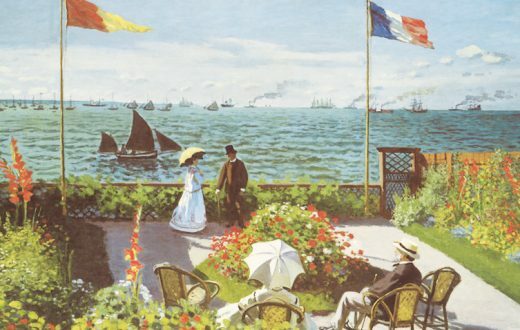 The six pigments used were black, white, blue, yellow, red, and green. Each color symbolized something. Green was growth life and fertility; red symbolized anger, fire, and victory; blue was for creation and rebirth; yellow was for gold and for eternity and was also symbolic of Ra and the pharaohs; white symbolized purity and the sacred. 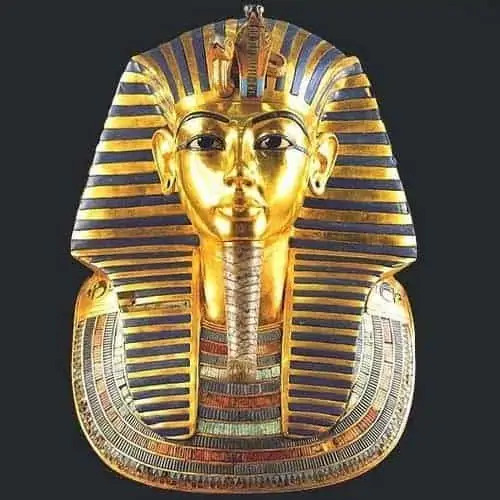 Gold, therefore, was used on funeral masks of the pharaohs to note that they were now gods, and white was used in the creation or representation of religious objects. It would seem that the Egyptians focused most of their artistic talent on glorifying the dead, and while that does seem to be the case, this misconception has to do with most of what has been found has been found in tombs. That said, one of Egypt’s most distinctive arts was that of the mummification of bodies and the sarcophagi in which they were placed. Crafted from precious metals, these burial caskets were recreations of the person in life. Besides the Sphinx and the Great Pyramids, one of the most famous examples of Egyptian art was that of the sarchophogus of Tutankhamen. In later years, during the Ptolemaic era, Grecian influence came into Egyptian art and more naturalistic paintings came into vogue. Artists were able to break free from the order and convention of previous eras and create softened and lifelike portraits of their subjects. One type of relief, sunk relief, is common in Egypt because handles the harsh sun and climate conditions well. Palaces included frescoes that depicted natural scenes on walls, floors, and ceilings. Popular subjects were animals, reeds, and water. The lines on scenes in hieroglyphs are known as registers. Where a person or object is in the register indicates its importance.